The Steely log cabin is done. It's going to live on the sofa in my hubby's place in Chicago. He needs a quilt to cuddle up under when he's relaxing. This is perfect. I tried something a bit different on the quilting of this quilt. I loved the quilting I did on this little quilt, so I tried it on a larger one. I'm not sure if I quilted it densely enough, but I love the randomness of the lines and the shapes that were created. I'll definitely little try this again. It reminds me a bit of shattered glass. Off to a debate tournament...then pack for the next trip. Off to Iowa State for hubby's track reunion. It's a hectic week, but then, when isn't it. Hope yours is great! Love the quilt & the quilting! Super terrific quilt. I must try your method of quilting sometime. We've always wanted to visit Chicago and almost did in August, but we went to L.A. instead because the trip cost was cheaper. I will get there eventually. I love the quilt. It's very pretty. 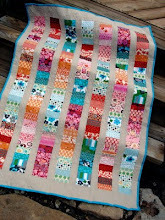 I just love your wonky log cabin quilts! And this is anonther beautiful quilt, or should I say handsome, cause it's very manly! oh, i like that quilting too! hmmm.... maybe need to try that on some future quilt. looks easier than curves, but still packs a great design punch. thanks for the inspiration! Your husband's place in Chicago...did I miss something? And who is making up his mind Jon or hubby? Forget the quilt...lovely as it is....reveal all!!! Really stunning... and the quilting is really cool. I love how you quilted this one. This is one of my favorites of yours. The greys with a peak of red are very intriguing. Wow, that steel grey is stunning. Nice job! Oh it's so nice! And the quilting really works so well with the quilt! Love it. This turned out beautifully! I love the way you quilted it-it does resemble shattered glass. It is such a handsome quilt. I love it! ANd I love the way you quilted it. Great job! 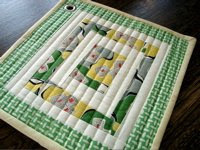 Great quilting, such a strong overall impact. I love the quilt. You have such a great eye. I can see where your son gets it! I like the quilting, too. What a great quilt. I love the random way you quilted it. Wow, I absolutely love the way you quilted it! You are so artistic! It is so elegant. I love those little pops of red. You'll be very close to me- let me know if you're looking for someplace to eat or anything while you're in the Des Moines/Ames area. 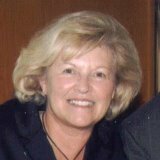 I'd love a chance to meet Jacquie in person! Awesome quilt! 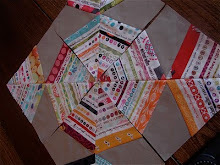 It packs a punch with those little bits of red and I love your quilting design. It suits the quilt perfectly. 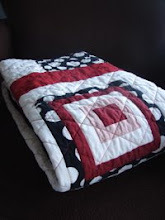 Love the red in the quilt and the quilting is great! Have fun in all your business. It's great, as usual! I love the abstract-ness of it all--each block different, yet related, and the unexpected bits of red that really catch your eye. I don't see how you could have quilted it any other way and kept that mood in the quilt. Have a great time this week! That is a super cool quilt! I love the randomness too. Mr. Blogger has not been playing nice today. I was afraid you'd have 3 comments from me. Apparently none showed up so...perfect quilting for your cool and modern quilt. Great job! wow, what a great quilt. i'm totally thinking about stealing your idea and making one for my husband. is that horrible? it really is perfect, quilting and all. I'm curious, too, about hubby's place in chicago. Like the rest of the commentators, I love the combination of the colors of the quilt and the randomness of the quilting. Sounds like something I would really like to try sometime. You create beautiful quilts! 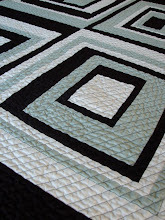 I LOVE the way this one is quilted! Your log cabin is fantastic and I love the quilted lines. Isn't it great to have a son you can take shopping? Have a great weekend. Another GREAT job!!! LOVE LOVE LOVE IT! What college in Chicago was your son looking at? My son is a senior at North Park in Chicago. We LOVE Chicago and will be there this weekend! Also...is your hubby working in Chicago? I probably missed that post! Keep up the great work! I like random abstract type quilting too. That quilt is a winner. love it! especially the quilting!! This is the an amazing quilt. I think the colours are spectacular. Really love that quilt - very manly looking. You do such nice work. Jacquie, this is one of my favorites! I'm glad your hubby is getting it because I was almost going to beg to buy it from you! I'm a huge fan of red and love how the red looks with all that gray and white. Have a great week. Thanks for the tip about the design wall as well. I ended up doing something a bit different but really used your advice to think on what I wanted. Thanks. It looks terrific! Is the fabric with the "peace-hands" the backing? I like the quilting you did on this, some day I'll try those lines too...maybe. It has to be a very good day. LOL! I first thought your post was called Steely Dan...! Steely is marvellous! I only know Chicago from TV series and films and I always get the impression it’s cold and wet and covered in lots of snow! I love the quilting. 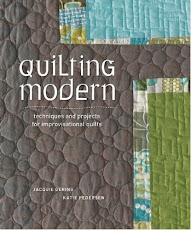 I don't have free motion quilting on my machine, so I am always looking for ideas of quilting with straight, or only slightly curved lines. I love this! Isn't it amazing that even if our lives are as hectic as they are we somehow manage to sneak quilting in there? Jacquie! I love your finished quilt! So creative - the way that you quilted it :) Always thinking up something new and inspiring! How fun, being in the windy city. I really want to take my family there sometime. I love the way you quilted that, and it does look like shattered glass! 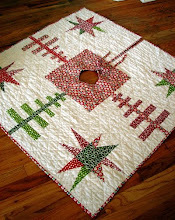 Love the quilting and flashes of red - fabulous! I love EVERYTHING about this quilt! the quilt looks fabulous, but i am confused. your hubby lives in chicago, but you dont??? Wow! 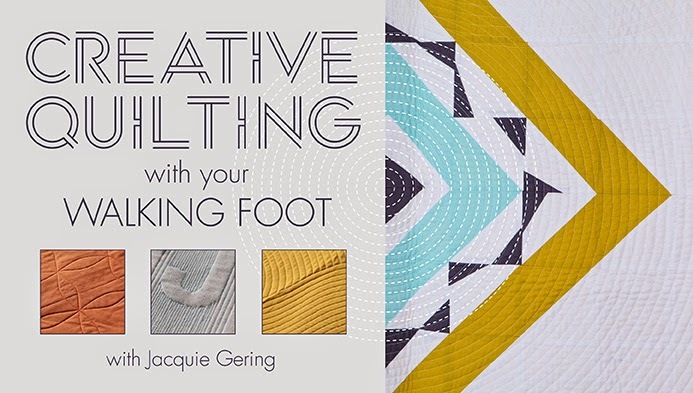 Jacquie, I love the quilting. Is it just random straight lines or did you have some sort of pattern? Safe travels to you, Jacquie! I love the random quilting lines! It really looks great! I like the way you quilted this and love the peace signing on the back!!! Happy to hear about the fun times you are enjoying with your son. this quilt is one of my favorites of yours! I love the quilting that you did...it makes it seem edgy to go along with the contrasting colors. Wonderful job! LOVE LOVE LOVE THIS QUILT!!! The quilting complements the quilt fabulously. Great idea. Your random quilting seems sooooo perfect for that quilt. I love your interpetation of everything you do! Wonderful quilt!!! The quilting is so "with it"! And hasn't the weather here in KC been windier than any day Chicago could have? Good luck with the "college shopping". Very artistic. I like it. Very non-traditional quilting and angular. I really like it and it fits the quilt totaly. I like this one. 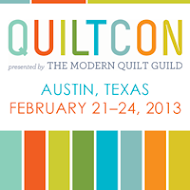 I have 2 boys for whom I'd like to quilt. Will be a huge leap for me to use solids, masculine, and focus on the geometry. Thanks for the inspiration. This quilt is really striking. I love the modern look and the quilting really works well with it. I think it looks very cool!